Redecorated living room of Apartment 1410, Prospect Tower. 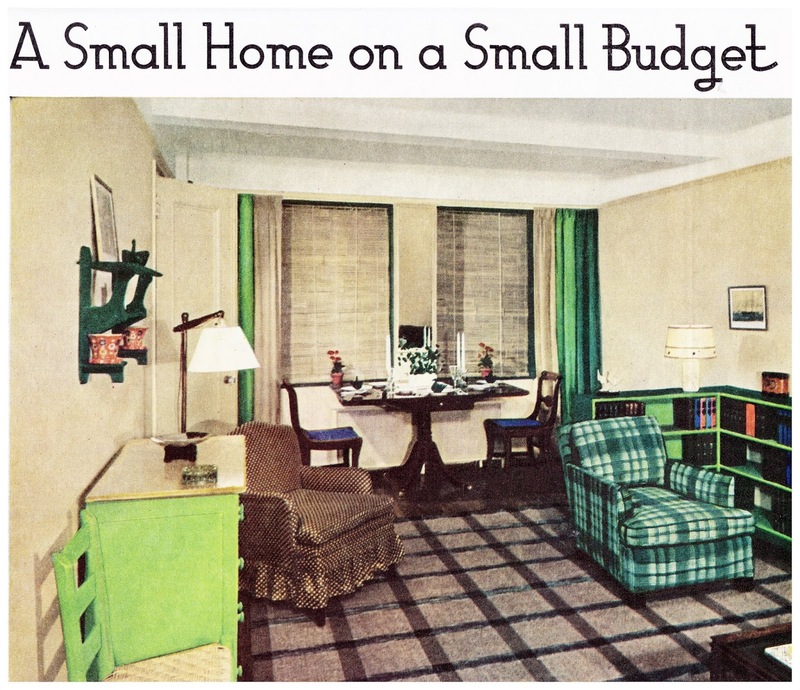 A look back to 1936 when a Tudor City apartment was remodeled for a Woman's Home Companion article entitled "A Small Home on a Small Budget." 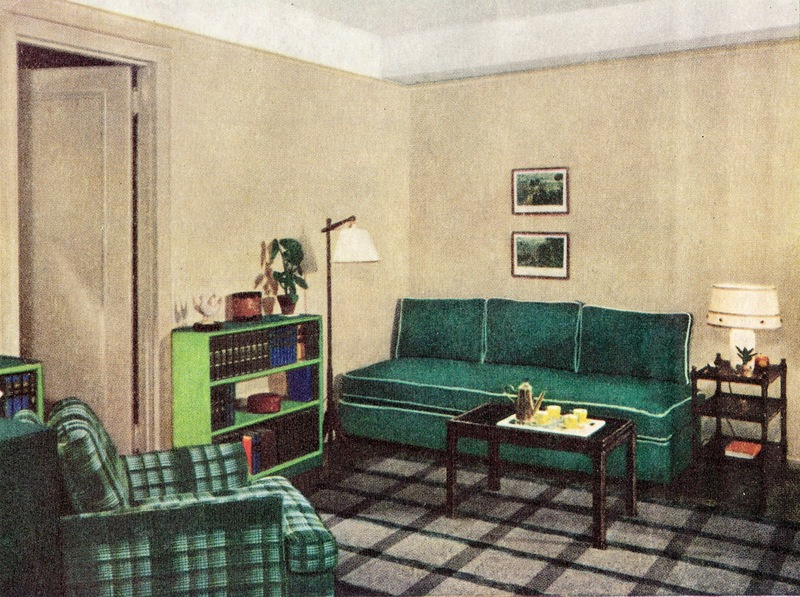 Virginia Hamill, the magazine's Interior Decoration editor, explained how the apartment was chosen. "We selected an average two-room-kitchenette apartment from hundreds of similar ones, being careful to choose one that possessed no unusual decorative or architectural features. . . This particular apartment is located in Prospect Tower, Tudor City, and will be on exhibition during the month of June. . ."
The design scheme was simple: "Both rooms were done in much the same color scheme, to give an impression of spaciousness and to allow interchanging of furniture." The cost of the renovation was a bargain $250 (roughly equivalent to $4,600 today). The article wistfully concludes "of course, with only $250 to spend, we couldn't buy everything of a quality that would last your lifetime, but we did buy nicely designed colorful things that should last until your ship comes in." Another view of the living room. The couch does double duty as a day bed, which "originally stood a little higher on its legs than we wanted. We sawed off two inches from the two front legs and two and a half inches from the rear legs, giving the bed a slight backward slant so that it would be more comfortable for sitting, and still be comfortable for sleeping." 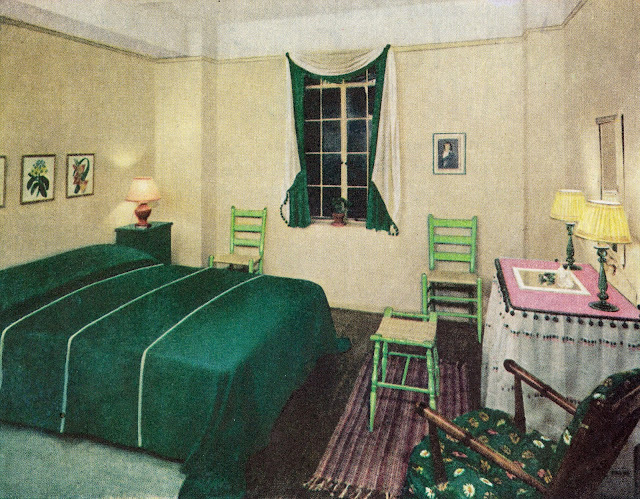 The bedroom, above, continues the same color scheme with "a brief touch of frivolity in the ruffled dressing-table skirt. Three colorful flower prints on the wall at the head of the bed give it height and make up for the lack of head and foot boards." Editor Hamill would return to Tudor City the following year to refurbish an Essex House one-bedroom. Read all about it here.